Sell Your Silver to a Nashville Silver Buyer Today! Nashville Gold & Coin Buyers offers the among the most competitive rates in the metro-Nashville area and outside of the State of Georgia, making us one of the premier silver buyers in the industry. The Spot Price – The spot price of silver is the current price per troy ounce, as determined by the futures commodity market. Purity of Silver – After verifying the weight of your silver, we’ll determine the silver content or purity of your items. As you would expect, an item consisting of 99.9% silver (Fine Silver) is more valuable than an item that only has 92.5% silver content (Sterling Silver) or less. 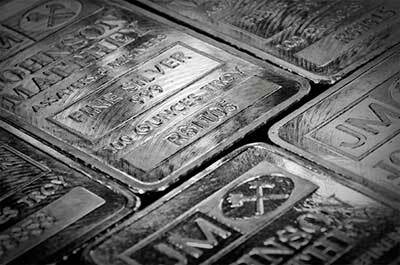 A collection of Fine Silver Bars from a private mint. Each piece contains 99.9% silver. Fine silver is soft and is not suitable for most jewelry, flatware, and other practical objects. Silver is often alloyed or mixed with other metals, usually copper, to improve its strength and other properties. Sterling silver is composed of a mix of 92.5% silver and 7.5% of other metals and alloys. Most jewelry and silverware manufactured in the United States is stamped to indicate that it is sterling silver. The most common markings found on sterling silver are Sterling, SS and 925. However, foreign produced silverware may contain hallmarks rather than the previously mentioned stamps, so always have your item(s) evaluated if you’re not sure. Ready to sell your silver bullion? Contact us now and receive a free and no obligation appraisal for your items. Dial 615.535.2785 for instant service.